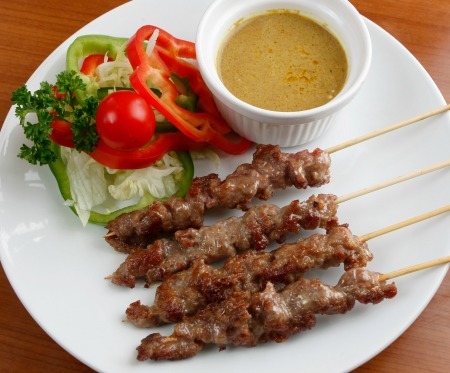 This barbecue beef satay kebab recipe on bamboo skewers not only tastes yummy but it's peanut free and the aroma that comes off the grill during cooking is to die for. As a serving suggestion I like it with my Thai salad and all you do is exchange the two beef recipes. Whilst researching this recipe I thought that Satay was synonymous with peanuts but you'll probably notice that there isn't a peanut in sight in the list of ingredients. After careful research I found that Satay is a more generic term for a meat kebab (usually goat, lamb or beef) grilled over coals and served with a spicy sauce - and sometimes that spicy sauce is peanut based. So on this occasion I decided to make my beef satay kebab recipe peanut fre. In essence Satay is the ultimate in Indonesian street food and I'm putting my own slant on it by using the spicy sauce as a marinade and then as a mop. For this recipe you're going to need at least an hour for marinating which is enough time to soak some bamboo skewers as well. Bamboo skewers need at least 30 minutes soaking otherwise they will char and burn during the cooking which not only is dangerous, your food doesn't taste great either. Pop all the ingredients into a food processor and blitz. Pour the marinade over the beef slices and throw it in the refrigerator for an hour or so. Because the beef is sliced the marinade has a massive surface area to work on so it doesn't need too much time and you can always help it along by giving it the occasional stir. Thread the beef slices onto the bamboo skewers longitudinally as though you are using the bamboo skewer like a needle, each slice should have at least 3 "stitches" per slice. This means that the greatest surface area is going to be exposed to the heat so cooking time is minimized and the beef remains moist. Depending on the length of your slices expect to get about three slices on each skewer and don't scrunch them up too tightly. 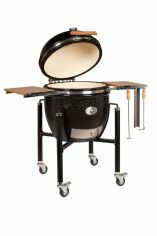 Give the meat about 15 minutes to come back up to room temperature and then we're ready for the barbecue. Cook gently for 3-4 minutes and continue to baste with the satay sauce marinade. Beef doesn't need to be cooked all the way through so do it to your liking, the 3-4 minutes that I've suggested will leave your beef nice and pink in the middle. As I said at the top, my serving suggestion is to lay these barbecue beef satay kebabs on my Thai salad and you're ready to go.